An artist's rendering of what The Falls apartment complex will look like. Kartchner, Inc. has begun work on The Falls, a modern, 228-unit, apartment complex in Snake River Landing, with an opening date slated for June 2016. 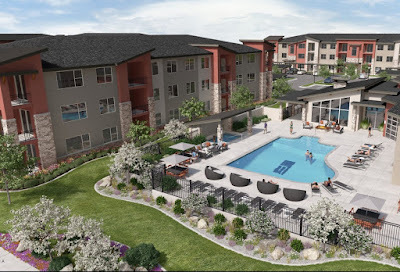 What is planned, according to a news release, is a pet-friendly community with “over-the-top” amenities, including fiberoptic Internet and a resort-inspired clubhouse and pool. The clubhouse is to feature a large pool area, with an all-year Jacuzzi and grilling station. It will also offer multiple fitness options, including a modern fitness room, a dedicated yoga-pilates studio, clubroom and game room. The Falls is situated on 9.5 acres located near I-15, giving residents access to Snake River Landing’s growing number of shops and restaurants and the city’s Greenbelt trail system. It is directly northeast of the site that has been platted for the Snake River Events Center. The Falls is pre-leasing now. Rents start at $875 a month, and include clubhouse privileges, city utilities, a Direct TV package and fiberoptic Internet access. Learn more at www.thefallsapts.com.